How to Buy a Car and Never, Ever Pay Retail...Ever!!! Warning! The car buying tips found on this site may cause frustration, irritation and possible devastation to car dealers around the country. Bad for them, but good for you! By following my expert tips to buying a car you will learn how to buy a car like a pro, potentially saving you thousands of dollars off retail. All you'll have to do is follow the car buying tips in my easy to read new and used car buying guide to learn how to buy a car faster, easier, with no headaches and for MAX savings! We'll check out some vehicles, smell the new car smells, go for a couple of test drives, and get you an amazing deal on your new car! "In my opinion, most people in the car business are not bad people, but their #1 job is still to get your money." All of it if Possible! Learning how to buy a car is not as difficult as you may think. It's basically one big game and all you need to do is learn the rules of the road by following my car buying tips. Whether you're buying a new car or a used car you're going to learn some tricks that will flip the dealer on "his" head and avoid car dealer scams in the process. If your credit is not the best, there is no need to worry, because you can learn how to buy a car with bad credit as well. It's not difficult if you are prepared. By the way, bad credit auto loans have been my specialty for over 10 years now and I've worked with most all the nations top bad credit auto lenders at one time or another. If you want more information on your credit, whether good or bad, make sure you check out the Credit Center where you'll find out "how auto lenders see you" by using your FICO Score and Credit Tier. Understanding your credit is key to getting prime rates and the easiest terms for not only auto loans, but all types of other loans as well. If you're looking for something specific, be sure to take a look at the Site Map. There is tons of information (literally, I weighed it :) and hundreds of pages full of new and used car buying tips, tricks and insider secrets to choose from. By the time you've navigated through my site and reviewed all of the tips on buying a car, you'll not only be prepared to get a smokin' hot, hassle free deal, but you'll be ready to walk into any car dealership and run the joint. If that sounds good to you, then congratulations, you've come to the right place. Just follow my new and used car buying tips and/or get answers to whatever car buying questions you may have and you'll be a pro in no time! Allow me to introduce myself, my name is Justin and I've been apart of thousands upon thousands of car deals and have over a decades worth of experience. On top of what I've done in the past, I am still currently in the car business and work as the Finance Director and Internet Director for an Arizona Chevrolet dealer. Get up to 5 New Cars at Edmunds.com from local car dealers and you'll see just how easy it is to save thousands (many, many thousands in some cases) with no negotiating and never having to set a foot on a dealers lot. 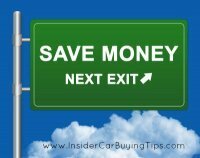 Let's take a quick look at one of my top car buying tips before we move on. This is actually one of the steps to buying a car that you'll find in my car buying guide and I consider it one of, if not the single most important step to follow. I shouldn't give it away so early, but just think, we're only 1 minute in to an 8 minute education...What might you be missing? If you want to know how to eliminate buyers remorse - virtually eliminate it anyway - you must borrow the car for the night. Give yourself a chance to wake up to the car in your driveway and see if you still have that "Gotta' have that car!" feeling.